(CNSNews.com) – The U.N. holds annual “elections” for its Human Rights Council this week and, once again, none of the five regional groups are offering any competition for the vacant seats. Instead all five are putting up “closed slates” of candidates – a practice seen as one of the main reasons rights-abusing regimes are able to secure seats. And such countries are able to secure seats, largely, because of closed slates – regional groups submitting the same number of candidates as there are vacant seats earmarked for those groups. Of all the annual elections held for the HRC since it was established, only the inaugural one in May 2006 saw contests in all five regional groups. In 2009, 2010 and 2011, all five groups offered closed slates – as they are again this year. The 14 “not free” HRC members this year are Afghanistan, Angola, Burundi, China, Cuba, DRC, Egypt, Ethiopia, Iraq, Qatar, Rwanda, Saudi Arabia, United Arab Emirates and Venezuela. Burundi, Ethiopia, UAE and Venezuela end their terms at the end of 2018, but they will be effectively replaced by four new members graded “not free” – Bahrain, Cameroon, Eritrea and Somalia. Like all of the 18 countries in line to fill the 18 vacant seats on Friday, the four will likely be ushered onto the council with no difficult since their regional groups, Africa and Asia, are offering no competition for the five vacant seats each has to fill. 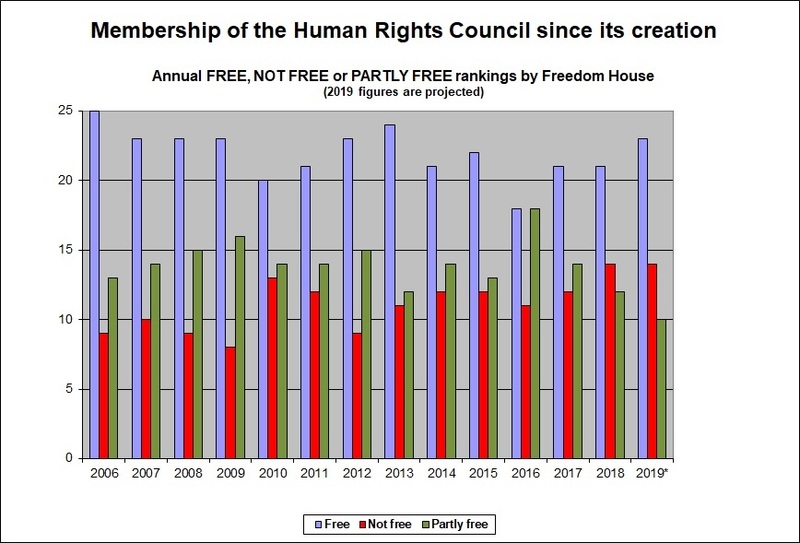 Furthermore, of the 14 “not free” members next year, three will also be among Freedom House’s 11 very worst-scoring countries for political rights and civil liberties. They are newcomers Eritrea and Somalia, and incumbent Saudi Arabia. Ahead of Friday’s election, three human rights groups produced a report analyzing all 18 of the candidates, examining both their human rights records at home, and their voting records at the U.N. The six candidates identified as unsuitable were the four “not free” countries (Bahrain, Cameroon, Eritrea and Somalia), along with two countries which Freedom House ranks as “partly free” but the three rights groups said were unqualified (Bangladesh and the Philippines). They did so on the basis of human rights violations at home, including poor rankings in the Reporters Without Frontiers press freedom index (the Philippines was ranked 133rd and Bangladesh 146th out of 180 countries). The two countries’ U.N. voting records were described as “negative,” and included opposition to resolutions supporting human rights victims in Iran, North Korea and Syria. The report urged U.N. member states not to vote for the six “unqualified” countries. Even in the absence of competitive slates, it said, countries are morally obliged not to vote for poor candidates. Withholding votes could deprive a candidate of the simple majority it needs – 97 votes in the General Assembly – The three groups argued that in such a scenario, better-qualified candidates could then step forward on the day. Despite such appeals in the past, some of the candidates with the most widely-criticized rights records have been elected to the HRC with large margins of support. In 2016, for example, the 193-member General Assembly voting by secret ballot gave 180 votes to China, 173 to Egypt and 160 to Cuba, while the previous year, Ethiopia received 186 votes and Burundi 162. Other “not free” countries to have been elected to the HRC with large vote counts in past years include: Russia (146), Saudi Arabia (154), Libya (155), Pakistan (151), Algeria (168), Tunisia (171), Mauritania (167), Bahrain (172), Qatar (177), Jordan (178), Angola (172), Cameroon (171), Gabon (178), Kyrgyzstan (174) and Congo (176). “Regrettably, when the U.N. itself ends up electing human rights violators to the Human Rights Council, it indulges the very of culture of impunity it is supposed to combat,” said Irwin Cotler, a former Canadian justice minister who heads the Raoul Wallenberg Center for Human Rights. UN Watch executive director Hillel Neuer expressed regret that the European Union has not spoken out against unsuitable candidates.